Imagine this–you’re walking back to your hotel or apartment on one of those famous white nights of St. Petersburg where it never quite gets dark. Your visa-free St. Petersburg trip has been great so far. The city is beautiful, the weather is perfect, but you’re looking to get some well-deserved sleep after a long day of sightseeing. The only problem is, the way to your accommodation seems to be blocked! By what? Well, it’s a section of road, raised almost vertically right in front of your face. Congratulations–you’ve come face-to-face with one of St. Petersburg’s famous drawbridges. Almost every night from May to November, 9 to 12 bridges are raised to allow passage of cargo ships from the river Neva to the Gulf of Finland. Some people think this is only for show–to make tourists happy. Not so! There is a real and practical reason to raise St. Petersburg’s drawbridges. These bridges are unique in the world. Nowhere else is there such a number of bridges that are raised daily. They are truly one of St. Petersburg’s great calling cards. There are a couple of ways to best experience the drawing of the bridges on your visa-free St. Petersburg trip. The first is to watch from a point on the Palace embankment between the Palace and Troitsky (in English – Trinity) Bridges. These two are probably the most famous and popular of the drawbridges in St. Petersburg. Many people try to see the Palace Bridge drawn up and close, then try to rush to the Troitsky Bridge. But it’s too far away to get there in the time between when the Palace Bridge finishes rising and when the Troitsky starts. Instead, you can park yourself halfway on the Palace embankment in a place where you have a good view of both bridges and enjoy the show without rushing. Another good viewing spot for the raising of the Palace Bridge is on the “opposite shore,” on the University embankment or on the Spit of Vasilievsky Island. Who says you have to watch from dry land? Boat trips are available and seeing one of St. Petersburg’s bridges rise from underneath it is an experience unlike any other. Regardless of what you choose to do on your visa-free St. Petersburg experience, don’t miss out on the raising of these majestic drawbridges! The good thing is that you can witness it from April to November– just over half of the year! 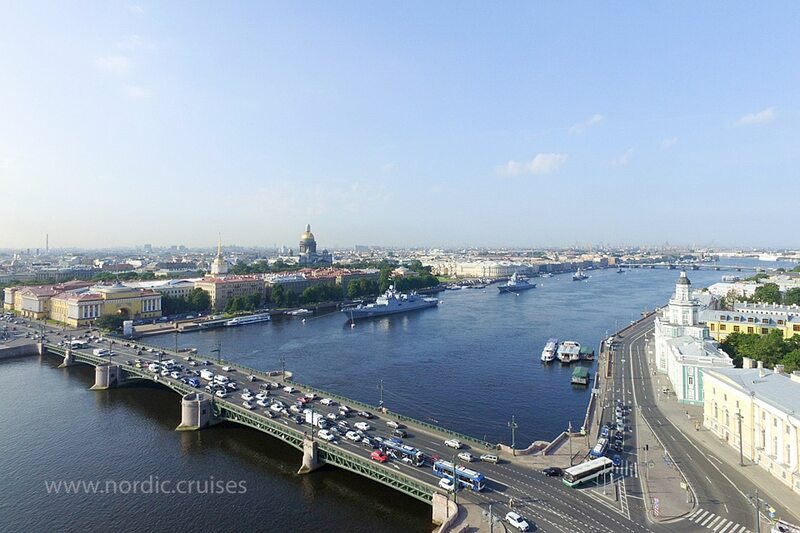 During navigation period from April till the middle November thirteen bridges that cross the Neva river are opened for a few hours to let large ships pass. Please follow the schedule below to get successfully to your hotel.